For those who don't know, the September Issue of Vogue, and most fashion magazines, is one of the most important issues of the year. With September being the start of Fashion Week and also having that back to school vibe, it's pretty much the beginning of the fashion calendar. Catch The September Issue on Netflix for a better insight. This year's September Issue brings a month of firsts for black women internationally. Beyoncé was given editorial control of American Vogue for their September issue and made history by appointing Tyler Mitchell as photographer. Thus making him the first African-American to photograph the magazine’s cover in its 125 year history. Although many black women have graced the front of the US magazine, only a handful of black women have done so for the September Issue, including Naomi Campbell, Halle Berry, Joan Smalls and now Beyoncé. On opening doors for other creatives: "If people in powerful positions continue to hire and cast only people who look like them, sound like them, come from the same neighborhoods they grew up in, they will never have a greater understanding of experiences different from their own. They will hire the same models, curate the same art, cast the same actors over and over again, and we will all lose. The beauty of social media is it’s completely democratic. Everyone has a say. Everyone’s voice counts, and everyone has a chance to paint the world from their own perspective." On the legacy she wants to leave for her children: "My Mother taught me the importance not just of being seen but of seeing myself. As the mother of two girls, it’s important to me that they see themselves too—in books, films, and on runways. It’s important to me that they see themselves as CEOs, as bosses, and that they know they can write the script for their own lives—that they can speak their minds and they have no ceiling. They don’t have to be a certain type or fit into a specific category. They don’t have to be politically correct, as long as they’re authentic, respectful, compassionate, and empathetic. They can explore any religion, fall in love with any race, and love who they want to love." Representation is so important and it's something I strive to achieve in every campaign I put together or event I write the guestlist for. It's something that's lacking in all industries, creative and corporate alike, and it's something that can only change when recognised and taken seriously. What people need to understand is, having one person of colour in your company who is an office assistant, cleaner or caterer (although all important roles) just doesn't cut it. I find it truly mind boggling when talking to senior managers and business owners about diversity and they think that is enough but then I remember, when they look around the room they are looking at themselves and that seems totally normal. It's only the people of colour who will look around the room and feel uncomfortable, disappointed but totally used to the situation. Going back to the magazine front, Edward Enninful placed Rihanna on the front of British Vogue for his September Issue, another iconic black female and another first! 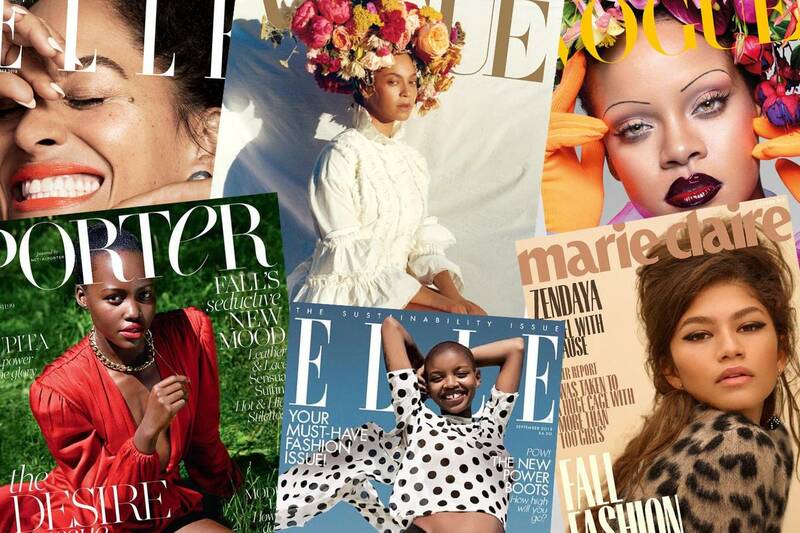 And other magazines such as Elle Canada & UK, Marie Claire US and Porter Magazine all had black cover stars this month. This is absolutely fantastic to see and as a woman of colour I will be sure to pick up these issues when I see them on the shelves. Although this is a cause for celebration, it has also left me with a feeling of sadness. How is it 2018, I've nearly reached the age of thirty, and we are STILL celebrating firsts for black women and women of colour*. It’s been fifty-three years since Donyale Luna became the first black woman on the cover of a magazine (Harper’s Bazaar in 1965), it was a big deal fifty-three years ago and shouldn't be now. Online magazines are applauding this month's diversity, but I will be eager to see if another month like this happens any time soon. This is a perfect marketing story and will most definitely increase September magazine sales, but I have little hope that representation will continue much after. Also, representation is a strong word for what we have been given this month. As a light skinned, mixed race black woman, I feel that I have been heavily represented. Beyoncé, Rihanna, Zendaya, Tracee Ellis Ross, Slick Woods, all beautiful light skinned black and/or mixed race women, the socially acceptable version of the black woman. Then there's Lupita Nyong'o holding it down for all the darker skinned and natural hair wearing women. I can give you a list of dark skinned stars who would absolutely own a cover, but thinking about it they are all American. For such a small island, Britain is full of incredible talent that should be celebrated and it's news like the appointment of Edward Enninful as Editor-in-Chief at British Vogue, Stormzy launching his publishing imprint #Merky Books, Zing Tsjeng writing women back into history with her Forgotten Women series and Gal-Dem taking over The Guardian this weekend, that I can really see improve our current state. We need to celebrate the 'different' and start giving more opportunity to our diverse population. I can talk about diversity and the lack there of forever so let's carry the conversation on in the comments. Share your favourite stories of people of colour being great. *My nieces are mixed Black, White and Indian and whenever I talk about race and diversity I have them in the back of my mind. I hope that when they reach my age we will be over the firsts and they can live as equals as women and as women of colour.